I wonder if Serena Williams is somewhere having a bit of a chuckle. Despite all that she’s done in recent years, many tennis experts were picking Victoria Azarenka to win the 2016 Australian Open. Angelique Kerber didn’t get that memo. Playing with a bit more pop and pace on her shots than in the past, Angie overcame a winless record against the Belarusian star, including a lopsided final loss in Brisbane a few weeks ago, and took out the 2-time Aussie champion, 6-3 7-5. Kerber had to hold off an attempted Vika comeback in the second set which had Angie down 2-5 0-40. But she repelled 5 set points against her and roared back to win 5 games in a row to win a spot in the semifinals, where unseeded but highly dangerous Johanna Konta of Great Britain awaits. Here’s a recommendation to the tennis experts. Nobody wins every match. That’s true. And I know there were some questions about her knee coming into Melbourne. However, I’ve seen too many times Serena romp through draws when she supposedly wasn’t 100% physically. So until Serena starts to show significant decline in her game, it’s probably wise to begin every tournament with the world #1 as everybody’s pick to win it. Steffi Graf’s Open Era record 22 Major singles titles is safe…for now. Her German countrywoman, Angelique Kerber, denied Serena Williams’ bid to match Graf atop the Major mountain with a 6-4 3-6 6-4 victory that stunned the tennis world. Sure, Angie had beaten Serena before, at the 2012 Western & Southern Open in Cincinnati. 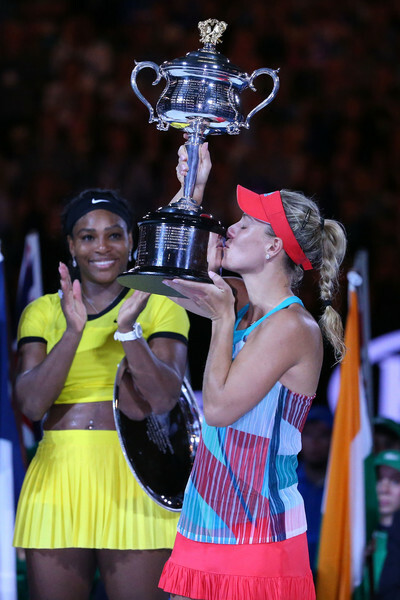 But since then, Williams hadn’t lost a set to Kerber and led their head to head 5-1 going into the Melbourne final. This is a better Kerber. She’s in better shape as well as flattening out some shots for more pace, especially her serve, which is seen as a weakness. She’s also getting more depth and power since adding gut strings in a mix with her poly strings. 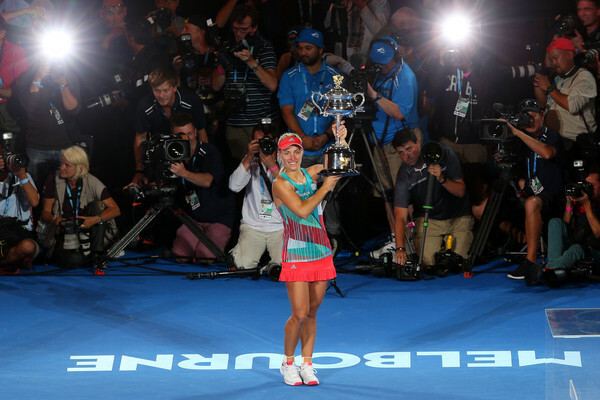 The German star put it all together to win her first Major singles title and rise to world #2. Not only that, but if this is real, if Angie has raised her game to the point where she can play like this on a consistent basis, it’s good for the game. If you are a Serena fan, maybe you don’t care if she’s virtually unopposed on her way to winning Majors. However, if you are a tennis fan you want actual competition. It can’t just be Serena alone on top and everybody else is just there to sell tickets for two weeks. Maria Sharapova’s game doesn’t bother Serena. Petra Kvitova has the game to challenge Williams, but not the consistency to get to finals as often as she should. Victoria Azarenka shows flashes of what she’s capable of doing, but isn’t quite 100% back to where she once was. Now that Angie has a Major win and has risen to world #2, maybe she’s the one to give Serena a run for her money. I guess we’ll see how Kerber follows this up. For today, we should just let her enjoy the biggest tennis victory of her life. She is the first German, male or female, to win a Major since Steffi Graf won Roland Garros 1999. She’ll take home $3.4 million Australian dollars (about $2.4 million USD) for the win. This is all the more impressive considering that despite her high ranking, the Majors have not been kind ot Angie. 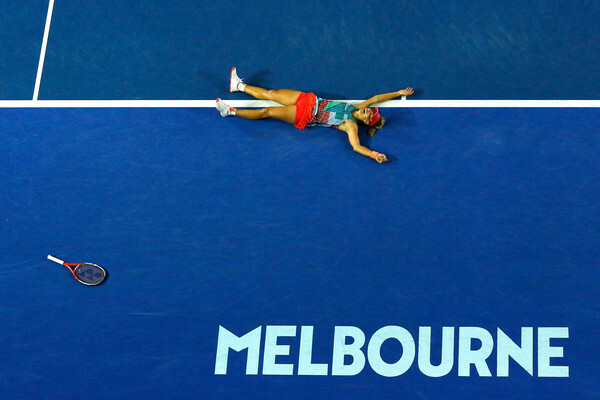 Not only was this her first Major final, she was often an early victim in Majors past, including last year when she lost in the first round of the 2015 Australian Open. She almost was out in the first round this year, when Misaki Doi held a match point against Kerber but couldn’t convert. It’s similar to when Li Na fought off a match point against Lucie Safarova in the 2014 Australian Open (third round) and then went on to win the tournament. 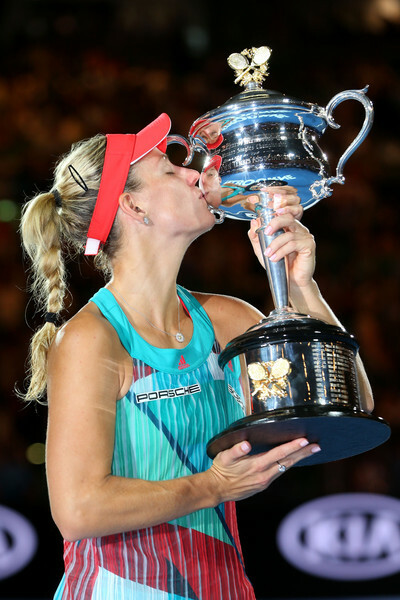 So congratulations to Angelique Kerber on a well-earned, hard fought victory. Hopefully, this is just a taste of things to come. 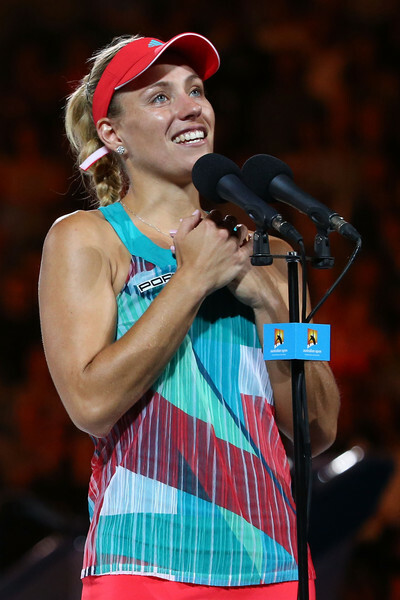 2016 Australian Open Women’s Singles Champion Angelique Kerber stepped out for the traditional winner’s photocall. The first time Major champion sparkled in front of the Government House holding the Daphne Akhurst Memorial Cup. Angie is the new world #2, coming a long way from where she was early last year. I hope she can sustain this high level of play. She is known to be a very emotional player. A player like her can thrive on confidence in the same way as a player like her can become mired in negativity. But Kerber has seemingly had a rebirth over the off-season. Keeping in mind that she was one point away from losing in the first round at Melbourne, I think this could be a title that changes how she sees herself and thus lead to much more success. After the Australian Open, I took a bit of a break from tennis and golf blogging and forums, then I became sick just as I was ready to resume. Now recovered, I was going to start posting at the conclusion of this week’s JLPGA event. Unfortunately, sad news from the world of tennis hastened my timetable. Bud Collins, one of the greatest tennis journalists, one of the greatest sports journalists, has passed away at the age of 86. A National Sportscasters and Sportswriters Association and International Tennis Hall of Fame member, Collins also covered other sports, including boxing where he was an early chronicler of Muhammad Ali, then known as Cassius Clay. Although he referred to himself as a hack, he was a skilled player in his time as well, winning a US Indoor Mixed title and reaching the final of the Roland Garros Senior Doubles. While known for his flamboyant dress, make no mistake, Bud Collins was an encyclopedia of tennis knowledge. He had great style, but it was also backed up by unmatched substance. So great was his impact as a tennis sportscaster, the USTA named the media center at the US Open in his honor. 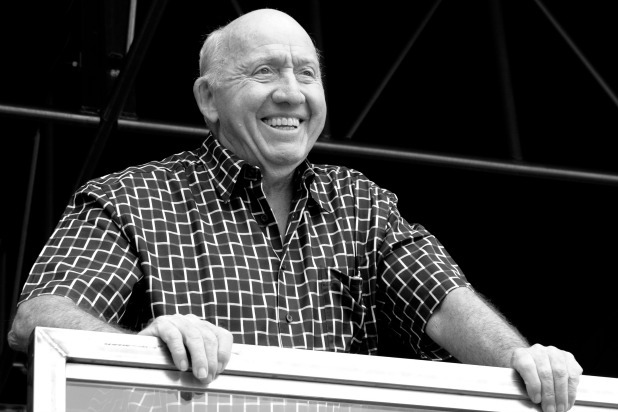 The tennis world, insiders and fans alike, have flooded social media in the past 24 hours to say what Bud Collins meant to them. To me, he was an accelerant. In the late 70s and early 80s, I was a child who had his love for the game sparked by my godmother and a stepmother. But that was the introduction. Something greater was flickering down deep. I was a fan of boxing, baseball, basketball and football, but something about tennis drew me in. I would turn on NBC and see Bud Collins. Sure, he was over the top with his passion and enthusiasm…and his pants…oh, those crazy pants. But I got him. I understood him. Although not nearly as demonstrative as he was, inside I was that same fanatic about the game. Using players today as an example, there are some who say they are tennis fans but upon further questioning they really only follow a couple of players. If Serena Williams or Venus Williams isn’t playing, they aren’t watching. If Roger Federer goes out early, they lose interest in a tournament. If players who grunt/scream like Maria Sharapova and Victoria Azarenka are playing they won’t watch. Some say they prefer the grace and style of the game before all the booming serves and baseline bashers. I am more like Bud Collins. The game itself is the passion. Whatever era, whatever players, I’m in. Sure, I’d like to see the big names in the big matches. However, I get jazzed to see a final between Carla Suarez-Navarro and Jelena Ostapenko as well. 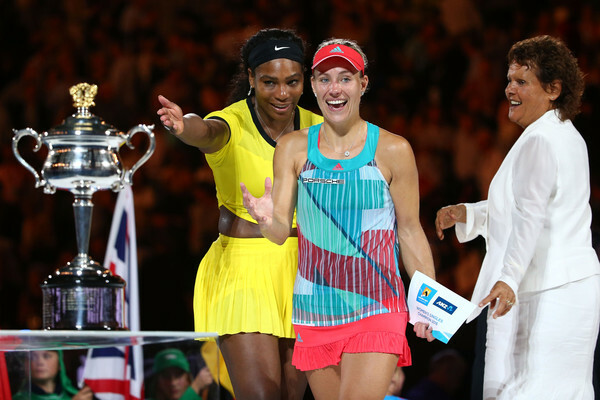 They played a sensational final in Doha recently, but I bet a lot of so-called tennis fans paid no attention. It’s tennis. It’s TENNIS. IT’S TENNIS!! If tennis were a corporeal being, if the game itself were somehow incarnate, I would throw my arms around it. That’s what Bud Collins did. So as a very young tennis aficionado, his demonstrative passion fanned my tennis spark into a flame. It’s been burning ever since. Thank you, Mr. Collins, for being a mirror of how I feel inside about tennis. May you rest in peace. Last edited by bangkokbobby; 03-05-2016 at 11:09 AM. The last time I saw Maria Sharapova, she was looking fantastic at the 2016 Vanity Fair Oscar Party. Of course, I’d much rather see her on the tennis court where she is a 35-time WTA singles champion, including 5 Majors. 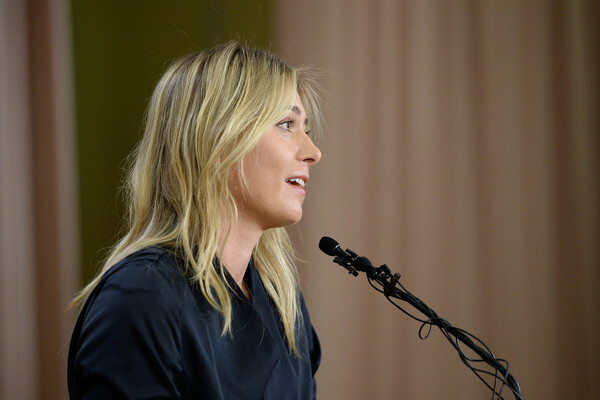 I’m beginning to worry that part of her life might be coming to an end as Masha has called a press conference for Monday, March 7th at noon Pacific time/3PM Eastern time. Her management says to expect a “major announcement” from the Career Grand Slam winner. The 28-year old former world #1 has enjoyed a stellar career, but has also endured a variety of injuries that have taken her away from the court for prolonged periods of time. She hasn’t played since the Australian Open this year due to an arm injury. This is after missing the majority of the second half of 2015 with ailments. I can’t imagine what the announcement could be if it’s not concerning retirement. Any business announcement would not need such a secretive and specially called presser. If she were pregnant or taking the year off for her health, she could make that announcement on Facebook and her website. Hopefully, there is no major illness to announce, If Masha is retiring, and let’s see if she is before singing her career praises, I will certainly have a lot to say about what she has meant to the game. Bud Collins was another one of those guys that you grew up with in sports. They were always there. For Tennis it was Bud Collins. I am a huge Masha fan, but I have to treat her like anybody else in her situation. A person can be forgiven for reacting with skepticism when an athlete says they didn’t know they were taking a banned substance. Too many liars and cheaters have come before. Still, I’d like to maintain a case by case evaluation point of view. Sharapova has been a professional since her 14th birthday. She will be 29 on April 19th. There hasn’t been a whiff of suspicion surrounding her concerning banned substances. The drug in question, mildronate aka meldonium, was added to WADA’s banned list in January of this year. Sharapova says she has been taking this drug legally since 2006 when her doctor prescribed it in response to various ailments, including an irregular EKG and a history of family diabetes, two prime reasons this drug is used. She claims to not have realized that meldonium was the same as mildronate, the name the drug was prescribed to her as. If this is all true, then this could reasonably be seen as a mistake, a very costly mistake. Tennis has come down pretty hard on people who have failed tests. Despite her fame and stature in the sport, you can’t have rules taken seriously if penalties are not equally meted out. Many of Masha’s contemporaries have expressed disappointment that Sharapova failed a test, but also back the notion that it was an honest mistake. Martina Navratilova, Ryan Harrison and James Blake were among those who tweeted support. Jennifer Capriati was not. She tweeted that “i didn’t have the high priced team of drs that found a way for me to cheat and get around the system and wait for science to catch up”…well, ok. It really all comes down to whether you believe Masha or not…or does it? A third option exists. She could be telling the truth…and getting a competitive advantage. In addition to treating heart conditions and diabetes, meldonium has shown in some tests to help endurance. So Masha could honestly have taken this drug for her health conditions and gained an advantage in endurance. In recent years, Masha has a very good record in 3-set matches. I wonder how Garbine Muguruza, Eugenie Bouchard and Simona Halep feel about this. They all lost in 3 sets to Sharapova when Masha won Roland Garros 2014. Masha won the final set in those matches (quarters, semis and final) 6-1, 6-2 and 6-4. Is it possible, even if it were inadvertent, that the 5-time Major winner had a little extra in the tank going down the stretch? Might she have beaten all three of those players regardless of meldonium or not? After all, it hasn’t helped when the 3 setter was against Serena Williams. The one truth I do know is that none of us really know. People will make up their own minds whether they believe her or not. In some cases, many cases probably, it will have less to do with what she said in her press conference and more to do with how people already felt about her. Only Masha and her doctor know for sure if this was a costly, but innocent, mistake, an attempt to get an advantage or an innocent mistake that inadvertently led to an advantage. I will say this, whenever she comes back…assuming she does come back…she wants to, no retirement here…she can’t get busted again. That’s obvious. The tennis world will by and large welcome her back. And if she continues to win…assuming she can avoid all the injuries that have stymied her in recent years…she can claim a measure of vindication. But Masha will never erase the memory of this. People who don’t like her will take every opportunity to remind the world of this. It’s too bad, but that’s the price she will pay for, at best, not being vigilant about what she put in her body or, at worst, cheating. Last edited by bangkokbobby; 03-08-2016 at 09:07 AM. I take her at her word. It seems arbitrary that some drugs are all of a sudden on the list and then off the list. THere was a good program recently (I think HBO Sports ?) that showed how the whole system is corrupt and arbitrary and that the innocent can easily get railroaded (not saying that is what is happening here).